Dogs have truly become an integral part of our everyday life, we love them and best believe they love us too but is that really enough? A healthy man’s best friend is no doubt a happy man’s best friend and as such, it is necessary to go the extra mile to keep our furry friends with us as long as possible. One way to do this without breaking the bank at the vets is to employ the use of the best dog vitamins on the market, taking the necessary supplements can go a long way. You may wonder if it is really necessary to give your pet vitamins, but just like you and I, they need that extra boost to keep them as healthy as ever. That is why we have written this guide, which will lead you to the best vitamin supplements for dogs for your mini best friend. This dog multivitamin is as multifaceted as they come; it helps your furry little friend in more ways than one and since they come in tasty little bites there is no doubt that your dog will be more than happy to indulge in this healthy habit. Produced by a renowned company that cares as much about canine health as actual dog owners, this product is packed with ingredients that are sure to be beneficial to your pet instantaneously as well as in the long run. Zesty paws multivitamin for dogs contains over 35 minerals, vitamins, and nutrients that are sure to leave their users as healthy as ever. It achieves this through a five action plan the first of which is total nourishment of the dog’s skin and coat; it does this with the aid of an anti-itch formula which is packed with cod liver oil, vitamin B7 and vitamin E resulting in its general groomed appearance. As part of its second point of action, this dog multivitamin contains OptiMSM which is a mobility boosting ingredient which works with a number of other vitamins to promote overall hip and joint vitality. If you thought that was all you are sorely mistaken as this product goes a long way in smoothing out the process of digestion seeing as they contain the digestive enzymes, Niacin as well as a five-strain probiotic; on account of this, man’s best friend can say goodbye to indigestion, bloatedness, loose stools among other stomach related issues. To crown it all up, this product also takes care of the heart and immune system thereby making way for your dog to live its best life possible, there is no doubt that it is qualified to be considered one of the best dog vitamins out there. This is one of the dog vitamins out there that is not choosy in any way seeing as it provides all the necessary nutrients a dog needs for all the wonderful stages of his/her life. Pet MD Canine Tabs plus is considered an advanced dietary source of nutrients, vitamins, and minerals that are required to keep your canine companion in the top shape and as mentioned earlier it is useful to dogs of all designations be it active, puppies, senior or working dogs. This stellar product is immensely useful where it counts seeing as it provides the necessary support for the immune system, it enhances the skin and coat as well as the general function of the eyes and brain. It also gives dogs the protein boost they need to build and repair the muscle tissues subject to wear and tear in the active life of dogs as we know them. The liver powder component of this top-notch product is responsible for its high protein content. To crown it all, this supplement can easily be administered, if your pet is not having it then it can be crumbled, mixed in with their food and the rest is history. What’s more, the product has been tried and tested then deemed safe by the Independent Lab Microbiological after being tested for E-coli, staphylococcus, salmonella, yeast, mold among other conditions that pose a threat to our esteemed pets. For the more advanced citizens of the canine world, this is one of the best senior dog vitamins that can be relied on to keep our canine companions revitalized for as long as possible. Just as it is with humans, as a dog reaches its golden years it becomes more necessary to give its body the vital nutrients and vitamins it needs to help it function as normally as possible. For this sole reason, the manufacturers of this dog multivitamin have come up with numerous products, this being included, that enable our canine companions to lead full and happy lives for the rest of their days. Adult dogs, a year or older, are the main beneficiaries of this product and with its naturally infused ingredients, this product enhances normal digestion, promotes muscle and bone development, makes for healthier looking skin and coats and can even be administered as vitamins for pregnant dogs. 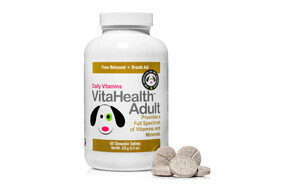 Vitahealth Adult Dog Vitamins can be considered an investment in the future of our canine companions as it contains ingredients, vitamins, and nutrients that play an important role in the long-term health of the dog as a whole. It contains vitamin A for dogs, vitamin B for dogs, vitamin C for dogs, vitamin E for dogs and even vitamin D, calcium, phosphorus, and potassium. In addition to revitalizing all its users, as an added bonus this product also tackles the issue of dental hygiene in dogs; it does this with the aid of natural antimicrobials that continually prevent bacteria as well as bad breath, so you can stop thinking twice before receiving those adorable doggy kisses. These next vitamins are not just dog vitamins, but they are one of the best senior dog vitamins on the market; their multifaceted nature makes them the best dog vitamins for our canine friends of all ages. Pet-Tabs Plus, with its new and unique formula, is manufactured by Pfizer Animal health and distributed by Virbac Animal Health, the tablets themselves were formerly called Pet-tabs. Its new and improved formula has an increased potency when it comes to number vitamins and minerals compared to its predecessor thus making it the go-to vitamin for active dogs or old dogs that need a little kick in their step. Best believe that being faithful to these chewable treats is not tedious, all that is required is a tablet a day and your canine companion is good to go. It should be no hassle to get them to gobble it down due to the presence of ingredients like corn syrup and pork liver meal which make it all the more enticing. These yummy additives are not the only thing this product has going for it, as aforementioned, there are a number of vitamins, minerals, and nutrients present that contributes to the general well-being of the dog as a whole. Some of these are folic acid, vitamin A acetone, vitamin B12, biotin among many other useful additives. Nutri-Vet Wellness has done the canine world well by putting this stellar yet affordable product on the market, all their products adhere to the highest of standards and this is backed up by the validation they receive through independent testing. Nutri-Vet Multi-Vite Chewables for Dogs works hand in hand with a plethora of vitamins and minerals to complement a dog’s day to day diet. This supplement is packed with an array of healthy ingredients as well as minerals and nutrients alike, it has calcium for teeth and bone development, Vitamins A, D, E and C which help with the skin and mucous membrane, digestive functions, cardiovascular issues, vision and the immune system respectively. It also has a number of variations of vitamin B and as such you do not have to bother about purchasing different components of this multifaceted vitamin. All in all, this results in enhanced activities of the digestive system, releasing energy from carbohydrates, fats and proteins as well as producing stellar red blood cells, brain function, maintaining good metabolism and aiding proteins in the building of tissues. 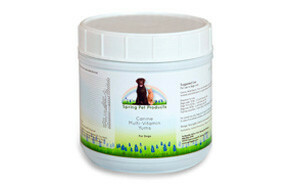 The Spring Pet Canine Multi-Vitamin Yums is no doubt one of the best vitamins for puppies on the market; the fact that it comes highly recommended by vets makes it even more enticing to pet owners out there. Though this product is a bit on the pricey side compared to its counterparts, you best believe that it is certainly worth every penny. This multivitamin administered in the dogs formative years makes for a good foundation as a whole by providing the dog with the necessary vitamins, minerals and antioxidants to promote growth, healthy skin and the overall wellbeing of the puppy itself. You do not have to worry about the administration of this vitamin, the puppies will have no idea that they are receiving medication because they are packed with a smoky bacon flavour that mimics a doggy treat. Its wonderful taste and high validation are not all it has going for it; it also contains an array of vitamins that tackle issues such as metabolism, skin and coat integrity, blood and oxygen flow, bone formation and so much more. You can be rest assured that your puppy will be growing and growing right; it is points like this that make this product one of the best vitamins for puppies out there, any user of these vitamins will not regret it in any way. The WetNozeHealth Vitamins for dogs is an advanced multivitamin plus for dogs of all designations; what really makes this product stand out is the choice of ingredients and the blend as a whole. This new and improved formula contains ingredients like turmeric, yucca as well as a canine probiotic blend. In addition to this, this multivitamin is packed with the right proportion of organic black pepper to boost the absorption of the turmeric as a whole. So, what exactly does this new blend of ingredients bring to the table? In the case of dogs who are a year and older, this antioxidant dog joint vitamins goes a long way in helping with issues like arthritis pain as well as unpleasant odours in urine and faeces. These ingredients are safely sourced within the US and as such, there is no need to be scared of any exotic strains that may be incompatible with your dog’s system as a whole. This blend contains all the essential vitamins a dog needs to get by a couple of which are vitamins A, C, D, E, Niacin, Vitamin B1, Pantothenic Acid, Vitamin B6, B2, B12, Manganese, Folic Acid and Biotin in addition to that, WetNozeHealth Vitamins for dogs is guaranteed to make your furry little friend as healthy as can be. The manufacturers and distributors of this supplement are so confident of this fact that there is a prompt refund policy for unsatisfied customers, there is no doubt that the need for it will not arise. 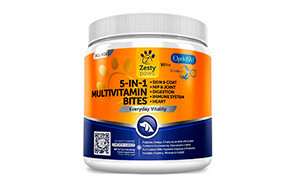 This dog multivitamin boasts of being the only certified dog multivitamin that is formulated solely for dogs, it offers the users an array of naturally cultured vitamins which are suitable for dogs of all ages and designations and due to the fact that it is as natural as they come it does not have certain adverse effects that synthetic vitamins come hand in hand with such as stomach upsets and its likes. If you are looking to give your dog one of the best dog vitamins out there, DR. DOBIAS SoulFood – Certified Organic multivitamin is definitely a viable option. As far as multifaceted dog vitamins go, this is one of the winners, containing a whopping 180 chewable tablets within. This product is not only highly recommended by veterinarians, but it also provides a viable balance of vitamins and essential minerals for active and adult dogs alike. Excel 8in1 Daily Time Release Multi-Vitamin for Dogs is as affordable as they come and in turn, provides top-notch supplements without breaking the bank. Buddy and Lola are back again with this incredible product that is sure to do wonders for your furry companion’s health and longevity as a whole. Coupled with the fact that this supplement will in no way put you out financially, it is a tried and tested formula that will transform your dog into an active and lively being after a few tries. Containing 34 vital vitamins, nutrients and minerals this product is bound to go a long way in transforming your dog for the better. The fact that it is delicious and tasty makes it an easy task for your pet to gobble it down and to top it all off there is a 100% satisfaction guarantee in the rare case Buddy and Lola Multivitamin for dogs does not tick all the boxes for you. There is a large number of dog vitamins out there, it is figuratively a dog-eat-dog situation when you are faced with the choice of which product to go for. When it comes to health, there should be zero room left to experiment and as such, this guide will give you all the pointers you need to make the best choice for both you and your canine companion. Believe it or not, this is one of the most important factors, all dog owners need to do their research and pick a product that is suitable for the age group which their dog falls into. Thankfully, manufacturers are quite helpful with this nowadays. They do specify whether their products are meant for older dogs or puppies, therefore, it is now up to dog owners to be vigilant and realize that everything does not go, these vitamins are age specific in some cases while in some others it is not. Seeing as this is medicine, we are talking about, there is no room to gamble, be sure to look for products that have commissioned clinical studies for their vitamins. This is just for that extra peace of mind when it comes to your pet’s health. Brand is one of those recurring factors you need to consider when you are making any purchase, talk less of a health-related purchase. Companies and organizations tend to live up to a certain standard that their brand has set for them and as such it is a wise choice to opt for big names in the pet vitamin sector. It is only in very rare circumstances that they would not live up to expectations. Since these vitamins practically fall under the umbrella of medication, it is no surprise that your local vet could be a huge help when it comes to picking the right one. They know more than you about which nutrients, vitamins and minerals our canine friends need to get by altogether, in addition to that they have front row seats to see the ones that work properly since they come in contact with numerous animals on a daily basis. There’s a saying that goes, what’s good for the goose is good for the gander, in this case follow the exact opposite because what is good for pet A may not necessarily work the same way on pet B. When they are on these vitamins, observe your pet closely to see if the supplements are doing more good than bad, or any good at all till you finally find what works for them altogether. When Should You Give Your Dog Supplements? These products should not only be administered when dogs are approaching their golden years, although they are known to be very useful for ageing dogs, nevertheless, in the case of pregnancy, ill-health, infancy and throughout their life as a whole, it is necessary to give our canine companions these supplements to promote their general well-being as a whole. Most especially in the case of dogs that actually eat home cooked meals, there is an increased need for supplements in their diet as a whole. This is due to the fact that most manufactured dog meals have these supplements in them already. This is a very vital vitamin when it comes to dog wellbeing as it aids in functions such as growth, foetal development, immune function, and cell function. It also goes a long way in enhancing the skin and coat as a whole as well as good vision. Naturally, it is found in food items like carrots, but since this probably is not a regular in a dog’s diet, it is important to get this from supplements. There are a number of B vitamins that are useful in a dog’s body as a whole, we have Vitamin B itself, B- complex, Vitamins B12 and B6 among others. None of these are naturally found in the food these dogs take in and as such it is necessary to seek out a good supplement. How important is it? Well, without this present in the body, your dog may experience symptoms such as hair loss, premature greying, increased cholesterol, tooth decay, excessive weight gain among others. It is in the best interest of all dog owners to load their wards up on the adequate amount of vitamin B. Though vitamin C supplements have been long considered useless to dogs due to the fact that their bodies actually produce it, there is no doubt that taking it as a supplement remains as useful as ever. First, it reduces stress in dogs, yes, our pets can become stressed too and seeing as there are no actual outlets to tackle this outwardly, it is good to start from within. According to the Whole Dog Journal, stress is the best-known cause of depletion in dogs and as such taking supplements to tackle that is a good way to keep that at bay. Though it does not make the top of the list when it comes to necessity, vitamin E is still quite useful to our canine companions. This vitamins aids with skin and coat related issues, vision, brain and nerve related issues, as well as reproductive and immune system related issues. It is quite clear that this is not a vitamin to joke with when it comes to the general well-being of our pets as a whole. These are vitamins that generally help with enzyme functions in dogs, this is quite important for the wellbeing of the digestive system as a whole and as such should not be taken lightly. Q: Does my dog need vitamins? A: There are a select few that would give a sounding no as the answer to this question, but all in all, a pet nutritionist would have the best answer to this. Not all dogs have the same conditions; when it comes to dogs that are ill, pregnant, ageing or extremely active it would be wise to put them on some form of supplements for their general wellbeing. Q: Is there any danger in giving my dog vitamins? A: In the case that a dog already indulges in a well-balanced diet consisting of all the necessary nutrients and vitamins, it is quite dangerous to ingest additional vitamins. This is due to the simple fact that too much of anything end up being detrimental and can cause a serious imbalance. Therefore, a high amount of these compounds in the system can be just as harmful as a deficiency of the same. Q: Should I check with my vet before supplementing? A: The answer to this is yes, as aforementioned, your vet has first-hand information on the health of your pet and can even connect you with a good nutritionist who can further breakdown the information for you. It is wise to seek validation from a professional before delving into the task of selecting a supplement. Q: Can dogs take human vitamins? A: This is a hard no-no; human and animal vitamins are worlds apart when it comes to issues such as dietary needs and the manufacturers and the proportions they used. Giving your pet a human supplement can overload them on nutrients they do not need in such high proportions, hence it is best to stick to what is manufactured for each species. These delicious dog vitamins are packed with over 35 vitamins, minerals and nutrients that aid in the overall wellbeing of your beloved pet. The great thing about this supplement is that it is not choosy, it can be used as puppy vitamins as well as adult dog vitamins, likewise, it can be used for pregnant dogs. It is healthy and versatile as they come with it 5-point plan of action that makes for a healthy dog all around.